Dave Struthers farms in Collins, Iowa. His feeder-to-finish operation markets 6,000 pigs annually. He also raises cattle and grows corn, soybeans and alfalfa crops on 1,200 acres. 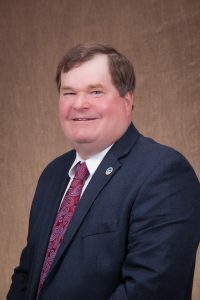 Dave previously served as the president of the Iowa Pork Producers Association (IPPA) and as a Pork Act delegate. In addition to being involved in pork industry activities, Dave serves as a leader of the Collins Christian Church youth group. The major issue today is profitability during the times of tariffs. We need to work hard to get all the pork we can into all markets worldwide. Promotion. Without having more consumption, why would we want to invest money into something that would increase production? Continuing to grow domestic and international demand is the best way to garner profitability. I have been independently raising pigs since I started farming at age 17. I have a love for pigs and want to help the world know why they’re valuable. My experience in IPPA leadership, Farm Bureau leadership, and communication in multiple venues, drive me to tell agriculture’s, and specifically pork’s, story.